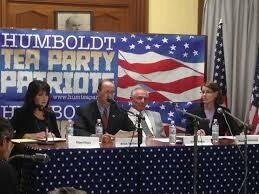 Humboldt's DA candidates have a lot of debating to do. Voters in Humboldt County’s 5th Supervisorial District will get their first chance to compare their candidates side-by-side Friday, as incumbent Ryan Sundberg and challenger Sharon Latour square off in the race’s inaugural debate Friday. The forum, which starts at 6 p.m. in Azalea Hall, is hosted by the McKinleyville Chamber of Commerce and will span three hours (three hours!). Chamber Executive Director Heather Vina said the forum is open to the public and will consist almost entirely of attendee’s questions for the candidates. Vina will moderate the discussion, and said the forum will be recorded to be broadcast on Access Humboldt on an unknown future date. Meanwhile, Mad River Union Editor Kevin Hoover recently hosted a discussion on KHSU between the two candidates in the 4th District race, incumbent Virginia Bass and challenger Chris Kerrigan, which can be found here. It’s currently unclear if additional debates or forums are scheduled in either supervisor race at this point. However, folks desperate for some testy exchanges can find all their heart desires in the Humboldt County District Attorney’s Race, which has no fewer than seven forums scheduled over the next couple of months. April 26, the Ocean West candidate forum in McKinleyville at 6 p.m.
April 30, the League of Women Voters, KEET debate at 6 p.m.
May 8, the Humboldt State University Constitution Forum at 6 p.m.
And, for those who missed them, the candidates have already verbally slugged it out a few times and have a couple of debates rebroadcasting on Access Humboldt — including this one and this one, which was sponsored by KHSU and the Mad River Union, with its audio also available on the KHSU website. The Journal will work to update the above list with additional forums, times, locations and broadcast schedules as more information comes in.